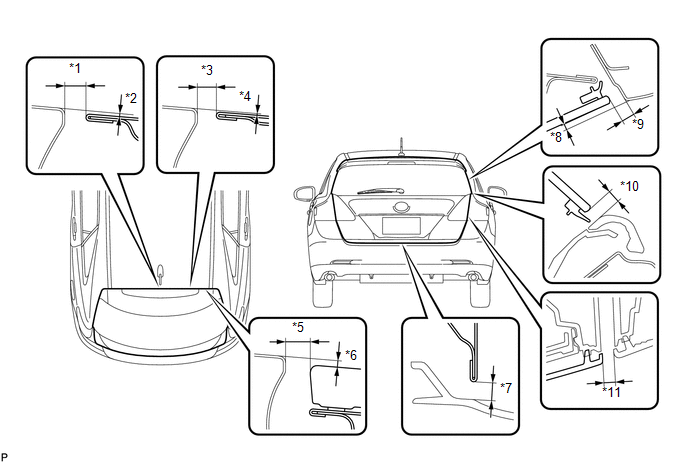 Centering bolts are used to mount the door hinge to the vehicle body and door. The door cannot be adjusted with the centering bolts installed. 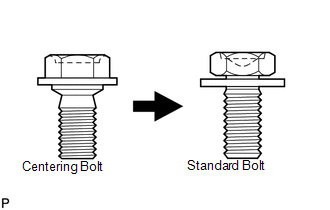 Substitute the centering bolts with standard bolts (with washers) when making adjustments. (a) Check that the clearance measurements of areas *1 through *11 are within each standard range. 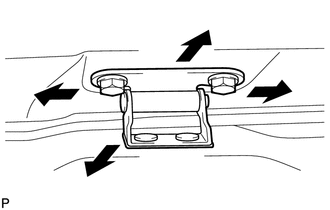 (a) Before adjusting the upper end of the back door up and down or left and right, loosen the bolts. 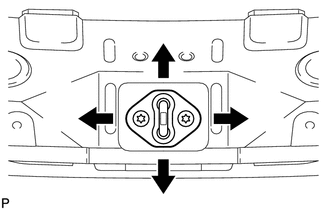 (b) Tighten the body side hinge after the adjustment. (c) Using a T40 "TORX" socket wrench, slightly loosen the striker mounting screws. (d) Using a brass bar and a hammer, hit the striker to adjust its position. (e) Using a T40 "TORX" socket wrench, tighten the striker mounting screws after the adjustment.